The original design of this Bergen was created to meet the specifications requested in an order from a Special Forces Unit. It was based on the PLCE Infantry Bergen, but the requirement was to expand the load capacity. This was done by replacing the front mess tin pouch with two rows of removable pouches giving six in all. We also gave the main rucksack a floating lid so the capacity could be enlarged easily. 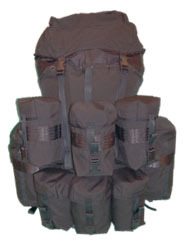 The bergen also retains the removable side pockets and yoke as per the standard PLCE Bergen; the side pockets and yoke can be used together without any of the other pouches or the main rucksack if required. These changes gave our bergan about an extra 10 litre capacity compared to the standard PLCE Bergan and made it a more flexible load carrier fullfilling the demanding requirements of the original special order. We made the original Bergans to ensure it could stand up to the extremely rough use it was to meet with the Special Forces Unit and we still make them to the same specifications today. The bergan proved to be so useful we decided to offer the design as one of our standard items with no change to the overall design or construction specifications. The bergen is available in Multicam, DPM and Black, with other camouflage patterns and colours available on request.